Finally! A rare, ranch-style home featuring main floor living on 2.5 Acres! 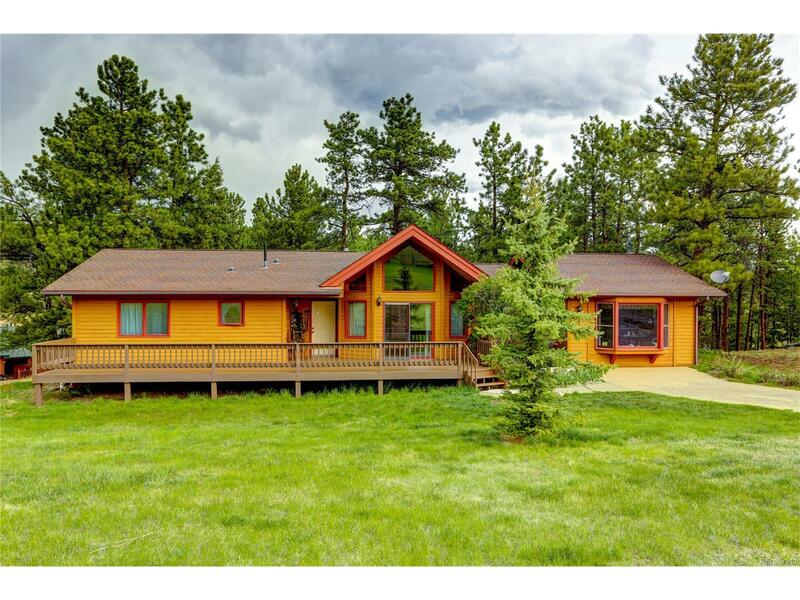 195 Bluebird Lane's south-facing orientation, looking onto a meadow and aspens, makes it even more desirable! Huge deck on front and rear offers serene relaxation. All rooms and baths, including flex space, are on the main floor! Beautiful, vaulted T&G ceiling in the Great room and Dining area makes this home feel even more like your Colorado get-away. Enjoy the gas, free-standing stove in the Great Room, also with hardwood floors. Wood windows, and most solid wood interior doors. Do you need an office, teen get-away, or hobby room? Wait 'til you see the large, additional Flex Space, also on the first floor! The water heater and furnace were replaced in 2016. Decks just refinished. A detached garage for mountain toys or vehicles features a snow blower that is included with the purchase. Large crawl space offers lots of storage potential! Only 6 minutes from Hwy 285.